MATHEW Vincent Menacherry’s debut novel, Arrack in the Afternoon, is the story about Varghese, a failed and drunken poet, who in a rare moment of sobriety decides to end his life. But, miraculously escapes from under the wheels of the truck he throws himself at. Karan, a conniving con man (read marketing guru) spots huge potential in the act and takes Varghese under his wings. Thence begins the fun. Through unscrupulous media manipulations and carefully orchestrated PR stunts, Karan cultivates Verghese into Vargi Baba, a celebrity god man. The social climb is fast but steady and in no time, he grows to become a sensation in the city. In the process, though, he loses the simple pleasures he cherished in his mundane previous life: his socialist friend Pillachan, who still holds a torch to Communism; Patricia and the free booze at her bar; and reading his favourite authors. Mathew leads us on a journey through the streets of Mumbai into the sleaze-laden celebrity culture replete with all the glitz and glamour that money can buy; into the pathetic lives of these vulnerable people and how their sadness and emptiness is camouflaged by worldly pleasures. He also recounts the protagonist’s love-hate relationship with Karan and how his bullying nature and abrasive language puts Verghese off. But he meekly suffers in silence, till the very end. 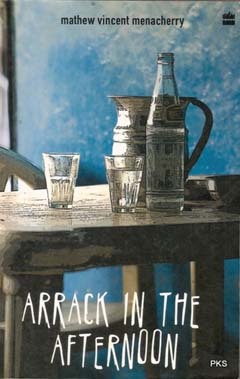 Arrack in the Afternoon is an attempt at exposing Mumbai’s omnipresent dirty underbelly that is tucked away behind money, fame, wealth and melancholy. The tale weaves through the debris and chaos that is modern-day Mumbai and also explores the phenomenon of instant stardom. The narrative is easy paced and humorous for the most part with some delightful moments of dark humour and pathos. The characters are so real, that they could very well be people you know. Varghese, as the reticent, intelligent and strong willed anti-hero is likeable and real. Karan plays the slimy fixer very well. Patricia, Varghese’s patient lover, and Sabu, the decent scribe, are well etched. There are several easily recognisable characters that are drawn from real life—gang-lords, socialites and politicians. Even though I don’t know any larger-than-life types, I just couldn’t shrug off a consistent feeling of deja vu as I turned from one read-worthy page to another. Then, as the imagery conjured itself up, it seized me that the plot could well be an excellent one for celluloid. The author, a Mumbaikar for close to four decades and unabashedly smitten with the Hindi film industry, is unable to escape the influences. Nor the inferences. Hard-hitting intimate scenes, god men, politicians, exploitation, sleaze in the upper echelons of society: sure-shot ingredients for box-office success. Perhaps you want to look out for the film, too.